Every spring, the roadsides turn purple. But I don't think that it's a native flower that's responsible. There are maybe three or four plants that seem to colonize disturbed ground around here, and this is one of them. And I don't know what it is. The flowers are hard to see. They're about half a centimeter across, purple, with five (I think) petals. After a week, the flowers will be replaced by sharp seed pods, that stick to clothes and dogs and anything that touches them. The leaves will dry out, and the ground will be covered with brown pricklies until the August rains allow some of the seeds to germinate. They have long, thick roots, too. I classify these as "weeds" in my lawn or garden. (I dig them up in the garden; the "lawn" is so hopeless that I just ignore them.) But I'm not sure what they are. I expect that they're something invasive - they take over places so aggressively, but I don't see them in places that haven't been disturbed by development. I don't think they're one of the species that the county Extension Office has flyers about (at the farmer's market, or at the county fair). Weeds are the most common plants that I see. I think. But they aren't in any of my plant guides. (They're not shrubs, and they don't really count as wildflowers.) I wish I knew what these things are. I assume it's a native, because I saw a lot of it in the desert around Las Vegas. I don't think it's the same plant, Andrew. The one that grows near me hugs the ground - I don't think I've ever seen it grow upwards. The flowers are little, so it's hard to tell, but I think they also look different. Thanks, Chuck - I'll start checking that blog regularly. I reminds me of filaree, which has corkscrew seeds. But filaree has a tender root and is very easy to cut off just below the crown. It does look very familiar. 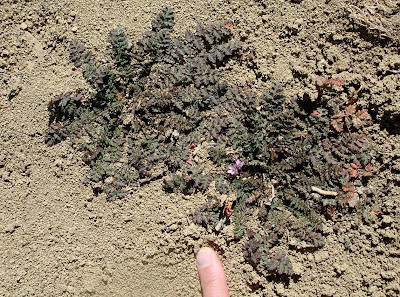 It might be this plant, of the geranium family, introduced and gone wild all over the west. It can grow taller in some places.